The new building has more space for offices, clinic rooms and areas to serve the public. Greene County Public Health employees, local officials, and residents listen during the ceremony in the open lobby of the new building. The old building can be seen through its windows. Greene County Public Health’s new facility still has a 360 Wilson Drive address. Anna Bolton | Greene County News Health Commissioner Melissa Howell addresses a crowd during the grand opening ceremony of Greene County Public Health’s new facility Aug. 13. 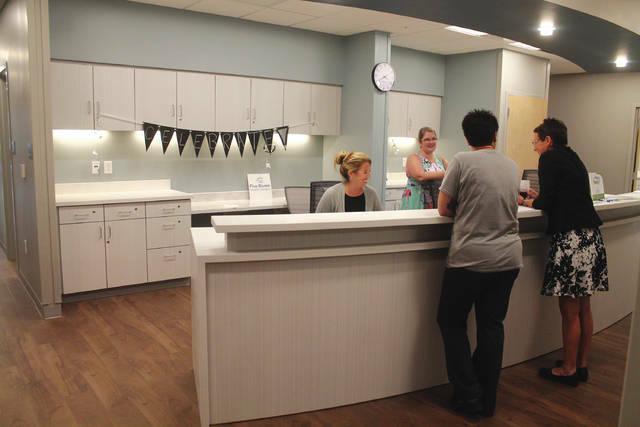 XENIA — Greene County Public Health will be open to the public in its new $7.8 million 28,500-square-foot facility Monday, Aug. 20. The brand new facility, adjacent to the 42-year-old round building at 360 Wilson Drive, has created space for additional offices, spacious clinic rooms, up-to-date equipment and new technology capabilities. 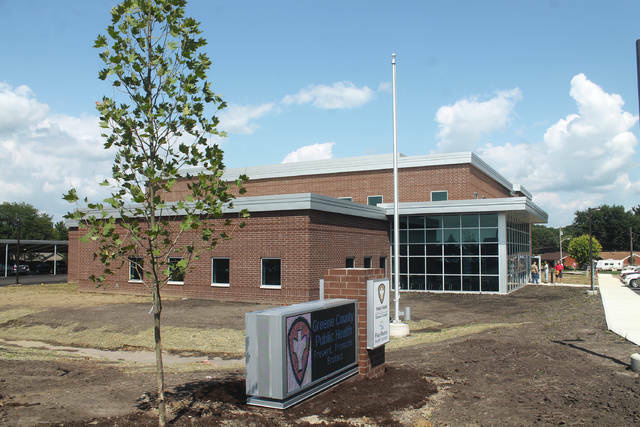 Funding for the new building came from combined funds received locally, Greene County Port Authority and Huntington Bank — not through public tax dollars or the public health levy. Root said the only delays in construction, which began in June 2017, came from weather. “Certain projects just mean a little bit more,” Chris Josselyn of Shook Construction, the firm that built GCPH, said. The first floor of the building will serve the public with access to birth and death certificate records, Women, Infants, and Children (WIC), early childhood intervention and other health programs. Upstairs houses offices for the 60-plus employees who will move in at the end of the week. Howell said GCPH is also seeking accreditation while in the new building. Until Monday, the old facility next door is open and serving the public. https://www.beavercreeknewscurrent.com/wp-content/uploads/sites/49/2018/08/web1_Desk.jpgThe new building has more space for offices, clinic rooms and areas to serve the public. 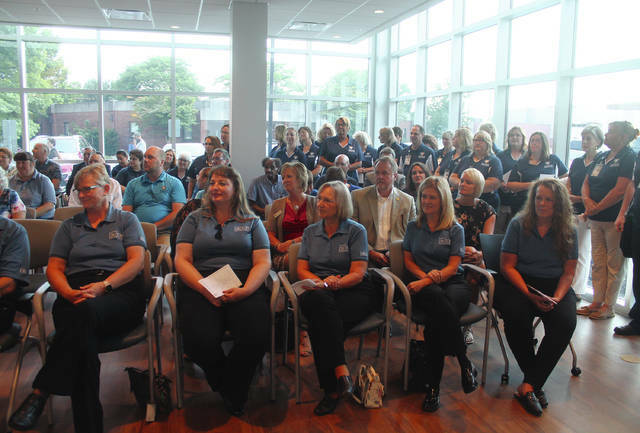 https://www.beavercreeknewscurrent.com/wp-content/uploads/sites/49/2018/08/web1_Employees.jpgGreene County Public Health employees, local officials, and residents listen during the ceremony in the open lobby of the new building. The old building can be seen through its windows. https://www.beavercreeknewscurrent.com/wp-content/uploads/sites/49/2018/08/web1_GCPHbuilding.jpgGreene County Public Health’s new facility still has a 360 Wilson Drive address. 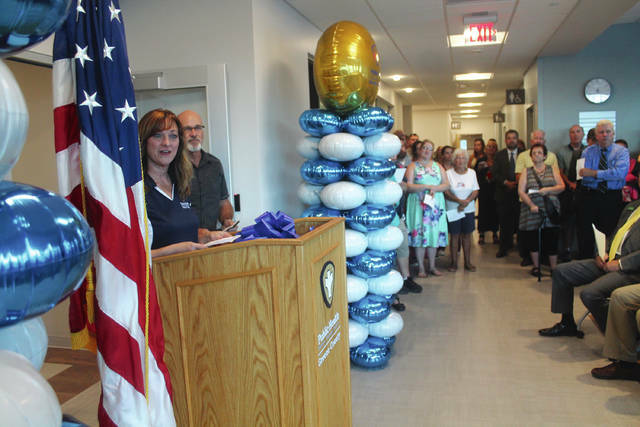 https://www.beavercreeknewscurrent.com/wp-content/uploads/sites/49/2018/08/web1_Howell.jpgAnna Bolton | Greene County News Health Commissioner Melissa Howell addresses a crowd during the grand opening ceremony of Greene County Public Health’s new facility Aug. 13.